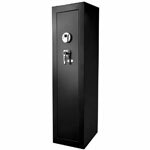 A Biometric Gun Safe is a safe with entry access by way of fingerprint. Biometric refers to a method for uniquely recognizing humans based upon an intrinsic trait. Biometrics is often used as a form of access control. 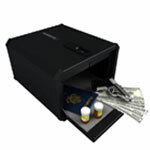 A biometric devise must be based upon a distinguishable trait; for example the gun safe and the fingerprint. Biometric systems offer some unique advantages, especially in the ways of identifying and authenticating human beings. Only biometric systems base authentication of identity on an intrinsic physiological or behavioral trait of a human being. Physiological is related to the body examples include but are not limited to fingerprints, face recognition, DNA, or iris recognition; were as behavioral examples include but are not limited to voice, typing rhythm, and gait also known as body mechanics. All biometric gun safe’s systems have their own advantages and disadvantages; however no matter what, unlike tokens such as smart cards or physical keys which can all be lost, stolen, and duplicated a biometric gun safe's entry system is nearly impossible to tamper with. Passwords can be forgotten, stolen, or shared, but these body and personal traits are individual specific.